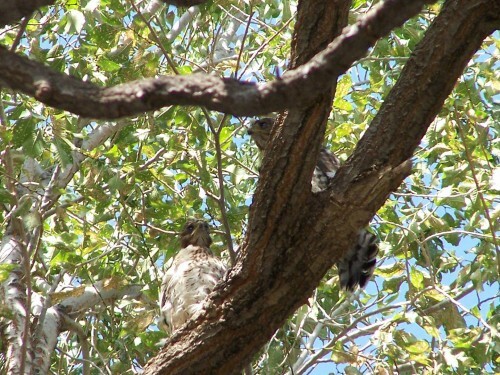 Nest Monitoring at New Mexico Tech /Hawks Aloft Inc. I don’t know what we’d do at Hawks Aloft without our many wonderful volunteers. One such volunteer is Vicky Gonzales. 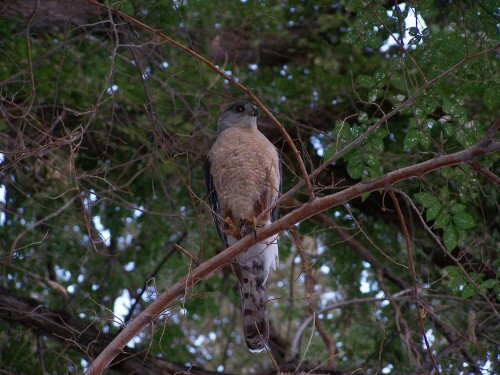 Vicky has been monitoring this Cooper’s Hawk nest on the campus of New Mexico Institute of Mining and Technology in Socorro NM, south of Albuquerque. This nest produced three fledglings. 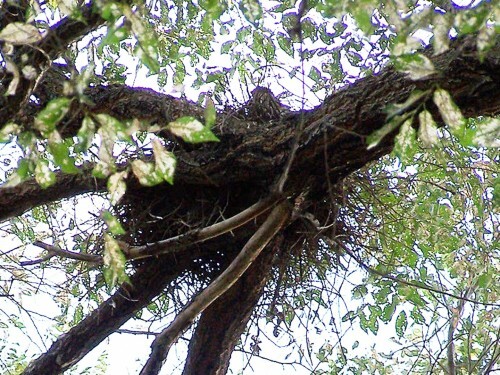 In the photo below, one is visible in the nest. At the time these images were taken by Vicky, two of the chicks had branched. Also called ‘branchers’ this refers to the time period when the young have climbed out of the nest and onto nearby branches in the same tree, but are not yet flighted. In the image below, one of the parents stands guard. Adults wear distinctly different plumage than juveniles. They have a horizontal rufous barring on their breasts and dark, solid gray backs. 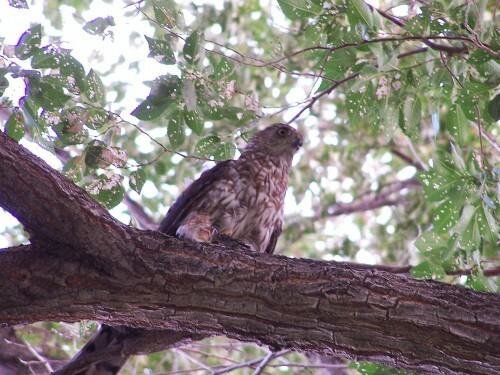 Eye color in Cooper’s Hawks, and all accipiters, changes over time, from blue-eyed babies whose eyes become yellow by the time they are six months old, to the dark red of older adults. Although it is tempting to try to determine the age of an accipiter by its eye color, the rate of eye color change is variable and can’t reliably be used as an age indicator. The bird shown below is a visitor to the nest, and not one of the parents. If you look closely at this bird you will notice a combination of the vertical streaking characteristic of a juvenile and also the rufous barring of the adults. It also has a yellow eye. Thus, we can say with confidence that this bird was hatched in 2012. Perhaps it was one of the fledglings from that year’s nest that is still tolerated by its parents. Cooper’s Hawks are found in wooded areas, from dense forests to suburban backyards. They sometimes show up at backyard feeders, looking for an easy meal – but not sunflower seeds. They have adapted to city life in their pursuit of Rock Pigeons and other small birds to eat. Many thanks, Vicky, for monitoring the nest and for your wonderful images of these beautiful birds.